Coast Live Oaks dominate the local landscape and have done so for millions of years. Revered by the first humans to inhabit our area, these oaks provided them with a good food staple from their acorns. Today, Coast Live Oaks are highly regarded as important trees in our landscape and as wildlife habitat. They are the keystone tree in our local oak woodland ecosystem and, as such, are protected by County ordinances. Nothing can compare with the majestic form and beauty of a mature Coast Live Oak. 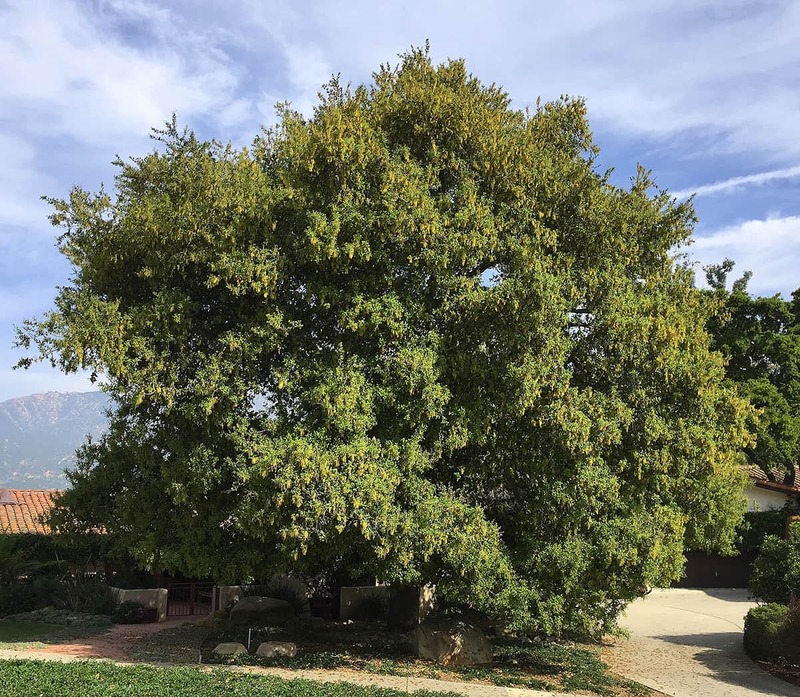 Appreciating this fact, Santa Barbara has designated it as the City’s official native tree. (The City’s official non-native tree is the Jacaranda.) It seems only appropriate for Santa Barbara to have two official City trees! The botanical name for Coast Live Oak is Quercus agrifolia. “Quercus”, derived from the Celtic, means “fine tree” – “agrifolia” refers to its holly-like leaves. The Coast Live Oak looks best in spring, bearing its flush of fresh, shiny-green, foliage. It produces male and female flowers at the same time, but you need to look closely to see the one- to two-inch long strings of male flowers, called catkins. A resulting abundance of acorns will develop over the summer and then drop in the fall. These oaks are usually slow growing, but under ideal conditions they can grow two to three feet in a year – and can live to be 250 years old! They should be planted with sufficient space for anticipated growth, since they can eventually reach a trunk diameter of over four feet and a branch spread of over 100 feet, although most remain much smaller. Being native trees, when established, they can easily survive on our normal rainfall. In severe drought, they can be stressed and will benefit from irrigation. Be very careful to keep irrigation water at least four to six feet from mature trunks, otherwise you encourage soil borne fungal diseases, like armillaria (commonly called “oak root fungus”), that can damage roots and trunk bases – and may prove fatal to the tree. When a Coast Live Oak is appallingly stripped of all its leaves over the course of just a few days, it is usually the result of a horde of oak moth caterpillars with voracious appetites. But, don’t be too alarmed; this will not harm an otherwise healthy tree – and may actually provide benefits, by removing old spent leaves and by providing fertilizer. Fortunately, a healthy tree will bounce back surprisingly soon with luxurious new foliage. Now is a perfect time to see iconic Coast Live Oak trees in our community. 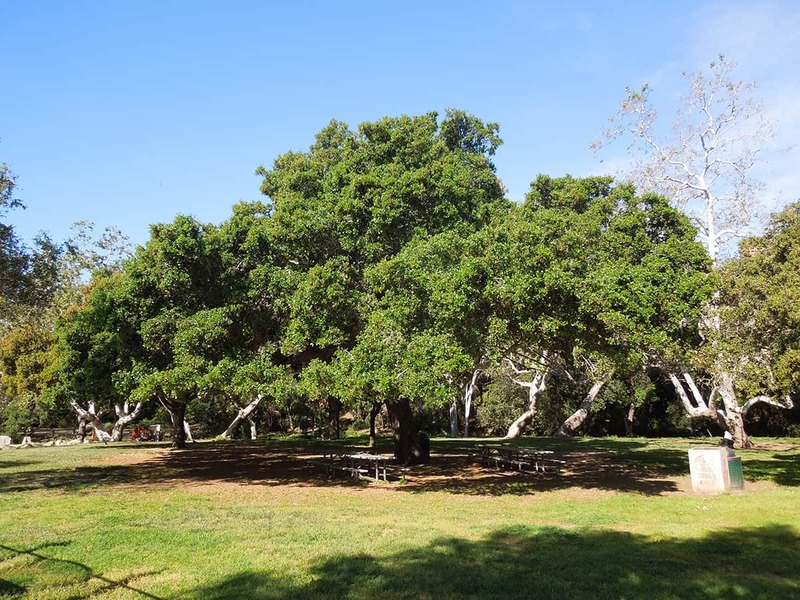 They are found in nearly all our parks, particularly in Rocky Nook Park, Oak Park, East Alameda Plaza, and the Santa Barbara Botanic Garden – and have been planted as street trees in the 2000-2500 blocks of State Street and in the 900-1400 blocks of East Cota Street.